Today you will visit the oldest capital of Normandy famous for its rich history, culture and gastronomy and the small typical village of Giverny where Claude Monet lived half of his life. This excursion also takes you down the backroads, past ancient villages along the Seine in the footsteps of the Impressionnists. Learn about the history of Normandy and the life of Claude Monet. 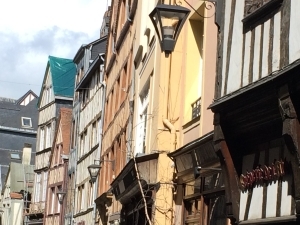 Your guide will pick you up from your hotel or apartment in Paris at 8.00 am, in a deluxe, private vehicle and, after a pleasant drive along the Seine River, you will arrive in the historic town of Rouen. 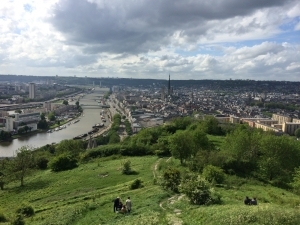 With your guide, enjoy a walk in the medieval heart of the city with a guided visit of the world famous cathedral of Rouen. The cathedral ‘s gothic façade was the subject of a series of paintings by Claude Monet, some of which are exhibited in the Musée d’Orsay in Paris. You will discover the Gros Horloge (an astronomical clock dating back to the 16th century), the beautiful Renaissance Palace of Justice and the site where Joan of Arc was burned at the stake in 1431. Nowhere is Joan of Arc more venerated than in Rouen. Learn about her life and how a young girl changed the destiny of a whole country. We used to say that the french national identity was born with Joan of Arc. Next, you will have time to relax and wander up the little streets, discover half-timbered houses and explore well-maintained public gardens before a gourmet lunch in one of the best bistrots in town. After lunch, enjoy the scenery along the Seine on our way to the beautiful village of Giverny, situated at the gates of the Normandy region. 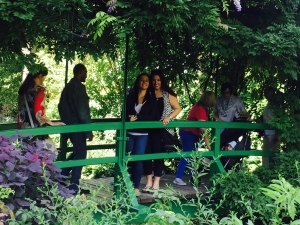 Time to visit Claude Monet’s house and gardens! Enter with your guide through a special entrance to avoid the queues. He will give you the tickets already bought in advance for you. Claude Monet lived in his home at Giverny for forty-three years, from 1883 to 1926. In 1890 he became the owner of the house and gardens, and transformed them completely. You will follow your experienced guide, first for a visit of the water garden with its famous Japanese bridge and water-lily ponds covered with wisterias, before discovering the flower garden in front of the house called the Clos Normand. This is incredibly beautiful, particularly between April and October (the vast range of flowers bloom successively, so that the garden changes gradually with the seasons whilst maintaining its colours and brightness). Enter with your guide inside the house and discover the first studio of Claude Monet, his bedroom, the dining room, the kitchen and his fabulous collection of Japanese engravings. After a stroll through the wonderful gift shop in Giverny , relax and enjoy the scenery whilst driving on the countryside road along the Seine Valley to reach La Roche-Guyon and its castle, elected by the French as one of the most beautiful villages of France. 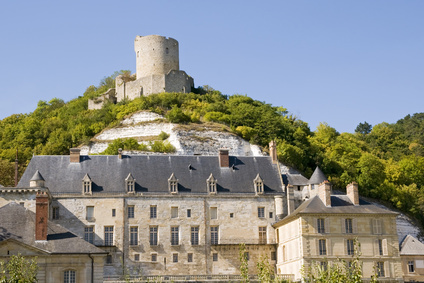 Located on a bend in the Seine, the Château de la Roche-Guyon has a unique setting nestled against a steep cliff. It was also occupied by the German état-major during World War II (General Rommel’s Headquarters). After a last photo-stop of this very colourful day, you will be dropped off at your hotel.